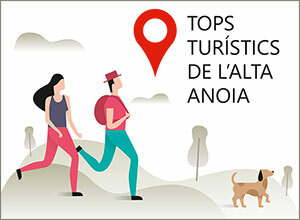 The Alta Anoia is located in the Center of Catalunya in the Comarca de la Anoia, near the border of La Segarra, Bages and Solsonés. Very close to the big cities from where you can enjoy the rurality that confer the 10 municipalities of the region, the majority with less than 200 inhabitants, only Calaf with 3,500 inhabitants assumes the capital. It is a quiet territory that lives calmly and without hurry, where life as years ago is marked by the guidelines of day to day peasants in the midst of nature. All traditional values have been maintained and taking advantage of the advantages that modern technology gives us. It is a living territory with emprenedoria. Renewable energies, such as wind power, among others, are a bet of the territory. Sustainability and respect for the environment is one of our objectives.